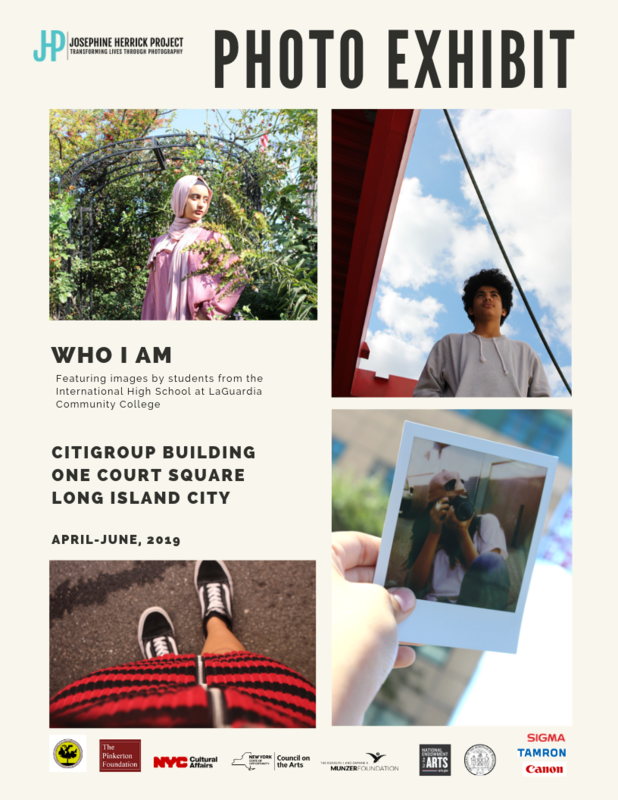 JHP is excited to announce that from April through June you can see TWO of our student photo exhibitions on display at the Citigroup Building located at One Court Square in Long Island City. Both exhibits feature the incredible work of students from the International High School at LaGuardia Community College, who took JHP’s Introduction to Photography and Visual Storytelling course in the Fall of 2018. There will be an opening reception for both exhibits on Tuesday, April 9th from 3:00-5:00 PM. This collection of images explores the concept of identity. While learning about composition and lighting, students were asked to take self-portraits and images that represent something about the person who created it. This collection of images explores is a visual presentation of photographic principles. Each session, students were given a unique composition challenge and asked to explore it in-depth. The colors and textures presented here show what we can find when we slow down, pay attention to details, and learn to see the world differently. Join us in celebrating March as Brain Injury Awareness Month as we exhibit recent photography from brain injury survivors. Their amazing images will be on display for the entire month of March at Saint Francis College in the Thomas J. & Anita Volpe Lounge, with an opening reception taking place Thursday March 7th from 5:00-7:00pm. In partnership with the Brain Injury Association of New York State, the Josephine Herrick Project provided free Saturday photography classes for brain injury survivors. Participants learned about digital photography and explored the surrounding community. This exhibition shares their unique perspectives on the world. Thank you to St. Francis College for hosting this class and exhibition, and to our amazing instructors Linda Kessler and Adam Isler! 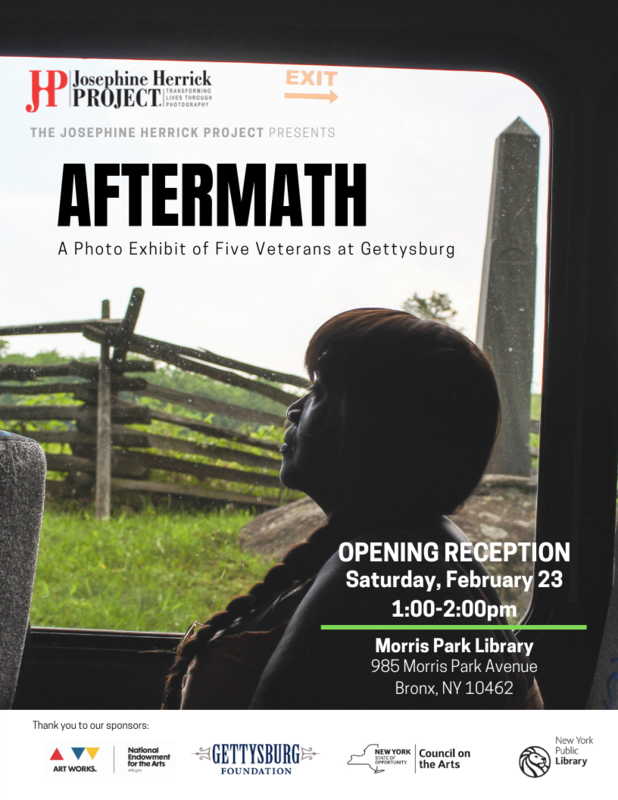 After being shown at the Gettysburg Museum and the Bronx Veterans Center, we are excited to announce that our exhibition AFTERMATH: Five Veterans at Gettysburg is now on display at the Morris Park Library in the Bronx. Please join us this Saturday, February 23rd at 1pm as we kick off this exhibition with a small opening reception. Over Memorial Day weekend in 2018, the Josephine Herrick Project, in partnership with the Gettysburg Foundation, brought five NYC-area veterans to historic Gettysburg for a photography workshop led by teaching artist and photojournalist Ashley Gilbertson. Participants worked with DSLR cameras and learned about photographic lighting and composition while also exploring a historic landmark. The images in this exhibition give you a glimpse into this incredible workshop, as well as into the aftermath of war on the places and people it touches. The Josephine Herrick Project just wrapped up its first semester at The International High School at Lafayette and we are thrilled to be exhibiting the students’ work at the Ulmer Park Branch of the Brooklyn Public Library. The opening reception will take place on Thursday, February 7th from 4-7pm, but images will be on display in the library’s community room for the month of February during regular library hours (M, W, F 10am-6pm; Tu 10am-8pm; Th 1-8pm; Sa 10am-5pm). This was inaugural class with The International High School at Lafayette, and we will definitely be back! This talented and energetic group of students met twice a week for an hour to learn the basics of digital photography, while also exploring the surrounding neighborhood. They learned about lighting and composition, and braved the cold weather for a photo field-trip to Coney Island. These students also had the privilege of taking their cameras home each week to photograph their lives, and this intimacy shows in their work. A HUGE thank you to our teachers, Edwin Maldonado and Matthew Hoffman, for making the magic happen each week. We would also like to thank the Pinkerton Foundation, whose generous funding made this program possible. The International High School at Lafayette is a small, alternative high school located in Bensonhurst, Brooklyn. Its mission is to assist its international population of students in developing their linguistic, intellectual, cultural, and collaborative abilities so that they may become active participants in today’s interdependent world. The Josephine Herrick Project, in collaboration with the McSilver Institute for Poverty Policy and Research, are pleased to invite you to: PhotoVoice: Reflections, a Step-Up Community Photo Exhibition. The opening reception will take place on Friday, December 7th (6:00-8:00pm) at Argo Tea (75 University Place, New York, NY, 10003). Images will be available for sale and on display through December 2018. Many thanks to Argo Tea for hosting this exhibition and reception. The images in this exhibition present New York City through the eyes of young people. Over a rainy Election Day and Veteran's Day in 2018, these high school students (from the Bronx and East Harlem) participated in an introductory photography workshop. During their photo walks around the city, students explored the theme of reflection, both literally, as they examined the raindrops and puddles collecting on New York City streets, and figuratively, as they thought about their identities reflected in the images they captured. In partnership with the McSilver Institute for Poverty Policy and Research, the Josephine Herrick Project leads a 3-day photo intensives for high school students in the Step-Up program. Students learn the basics of operating a digital camera and composing an image, and then apply their new skills by exploring the city around them. As part of the program, PhotoVoice participants come together with students from other high schools to hone their skills, build community, expand their horizons, and share their voices and ideas through the visual language of photography. In partnership with the New York Public Library, the Josephine Herrick Project presents Connections, an exhibition featuring the work of local senior citizens. Images will be on display through 2019 at the Kips Bay Branch of the New York Public Library (446 Third Avenue, New York, NY, 10016) in the 2nd floor Community Room and can be viewed during regular library hours (M-Th 11am-7pm and F-Sa 10am-5pm). For eight weeks (in August-September, 2018) these participants met weekly to learn basic techniques in digital photography. Their two-hour sessions often included a walk around the neighborhood as well as peer critiques, helping students develop their visual literacy and engage with their community. In between classes, participants took cameras home with them, documenting the people, places, and things they encounter everyday. The images in this exhibit are an exploration of feelings of connection and separation from the community. JHP and The Bronx Vet Center invite you to the opening reception for the photography exhibition on Wednesday August 8th from 5-7PM at 2471 Morris Avenue, Bronx, NY 10468. We thank our instructor Alberto Vassari for his hard work and dedication, and to the students for their excellent work. We hope that you'll join us for this event. JHP is proud to invite you to the photography exhibition of The Alzheimer's Association of New York City, who were part of the JHP photography class for the pilot Spring Program. Please join us Monday July 16th from 5-7PM for the opening reception of the exhibit. The class was led by JHP instructors Susan Rae Tannenbaum and Susan Falzone, who guided the students through story-telling through their imagery. The work is on view on the ground floor gallery at 210 E 43rd St, New York, NY 10017. Many thanks to FedCap for hosting the photo exhibit for the month of July. Please join us at the Aperture Gallery for an evening of cocktails, hors d'ouvres from a Casa Fox, and live a photo auction. JHP is also honored to offer a limited number guests the opportunity to have their photograph taken by Peter Hurley—one of the most sought-after headshot and portrait photographers in the US. To support the continued growth of JHP programs, purchase your tickets here. If you cannot attend but would still like to donate to us, please continue to our DONATE page.